This recipe comes from Mimi's Cafe. I love their soups and salads and even love the fact that they publish their recipes online. 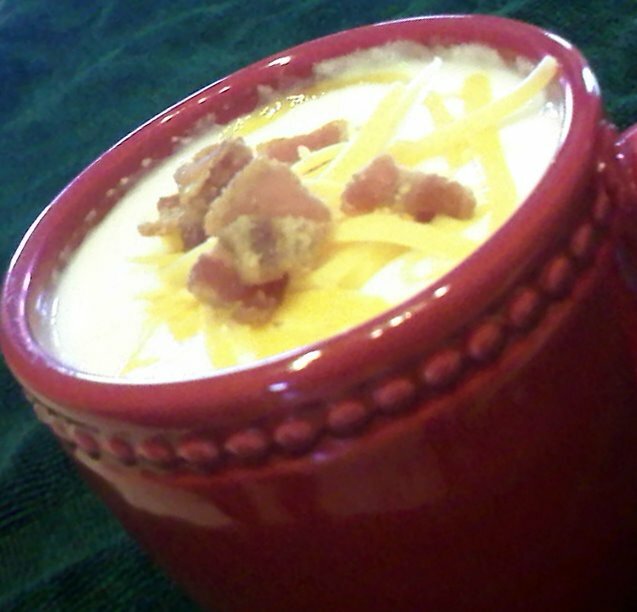 I love the smooth, creamy potato soup...so much better than the canned dry mix! Once you have this, you will never go back! Again, with cooking and baking, I like to make small adjustments. One is to use Yukon Gold potatoes....(I used Russets for this recipe) but I LOVE the golds...they hold their shape in the soup and they are so smooth and creamy! I for one, am not a celery fan...so I omitted celery. I doubled the potatoes and halved the corn in this recipe. It's all about whatever balance you like! Oh, and I top it with bacon and cheese....gotta have that! I thought I would speed up the process (we were starving) by pressure cooking the potatoes while cooking the bacon. When it came time to add the 'thickener' (cream and flour), it did not seem to thicken up. I even 'slaved' over the stove, stirring, simmering, stirring some more, for a good 15 minutes before I got desperate and made some more thickening with flour and water. This soup is even better the next day. It is thicker and the flavors meld into the potatoes.....mmmm...good! On medium heat, melt butter, then simmer onion and celery for 5 min. till soft. Add water, potatoes, corn and seasonings. Cover and simmer for 30 min. or till potatoes are barely tender. Whisk the flour into 1 c. of the half and half and stir into the soup. Add the remaining 3 c. of half and half. Simmer for about 15 min. until the soup has thickened to a creamy consistency. Correct the seasoning with additional salt and pepper, if desired. To correct the consistency of the soup, add a little milk to thin or cook another 5-10 minutes to thicken.